TDmonthly® - New Toys and Games: Twisties 7" Carded from PLAY VISIONS INC. Totally new concept in hair adornment for girls. 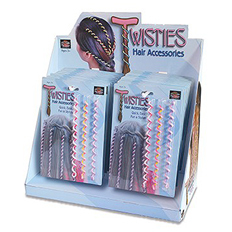 In seconds girls can wrap their hair inside the coils and have an instant hair accessory. As well, they can connect together to form an interesting myriad of spirals and coils all over their hair to create beautiful masterpieces. Comes with 3 pieces of 7" length per blistercard.